You can Special Summon this card (from your hand) by sending 1 other monster from your hand to the GY. You can only Special Summon "Defrag Dragon" once per turn this way. 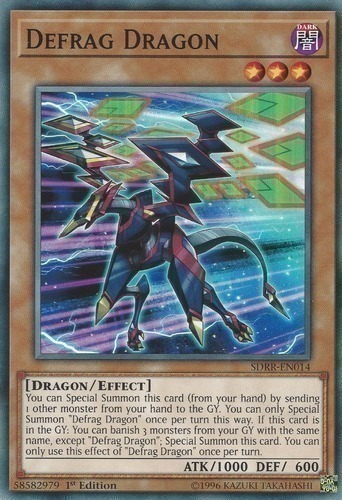 If this card is in the GY: You can banish 3 monsters from your GY with the same name, except "Defrag Dragon"; Special Summon this card. You can only use this effect of "Defrag Dragon" once per turn.